Carter hinted Wednesday he'd likely support Obama. 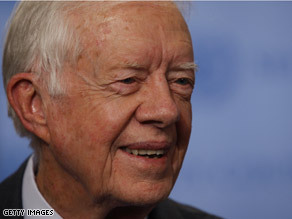 (CNN) - Former President Jimmy Carter all but said Wednesday he plans to cast his superdelegate vote for Barack Obama. Speaking with a Nigerian paper while in Abuja, Carter noted several reasons why he might be leaning toward the Illinois senator. "Don’t forget that Obama won in my state of Georgia," Carter said. "My town, which is home to 625 people, is for Obama, my children and their spouses are pro-Obama. My grandchildren are also pro-Obama." "As a superdelegate, I would not disclose who I am rooting for but I leave you to make that guess," Carter added. The Carter Center confirmed to CNN the newspaper did quote Carter accurately. Responding to the comments, Clinton campaign spokesman Howard Wolfson said Thursday, "Both Senator Clinton and President Clinton have a great deal of respect for President Carter and have enjoyed their relationship with him over the years, and obviously he is free to make whatever decision he thinks is appropriate with regard to presidential choice." Wolfson also acknowledged "people will be interested in the choice that he makes." Carter's remarks are the latest from the former president that suggest he is backing Obama over rival Hillary Clinton, although he has made no official endorsement. In an interview with the Wall Street Journal in January, Carter said Obama's campaign has been "extraordinary and titillating for me and my family." He also said then that Obama "will be almost automatically a healing factor in the animosity now that exists, that relates to our country and its government." Carter has never liked the Clintons. Bill Clinton got something Jimmy Carter never did - a second term. It's no surprise that he's all but endorsing Obama. When it comes right down to it, who cares who Jimmy Carter endorses? He is soooo irrelevant to today's world. Thats very promising!!. OH. what the Clintons will eradicate him. ohHHH NOOOO> lol lol. Get over it Clinton. your just showing how selfish you are. but you love this country so much you will give it to Mccain just to spite your rival MR. Obama in. and i bet Mrs. Hillary will switch parties to be Mc Cains VP. now that would be a laugh. Carter was not a very good president, but he was a president nonetheless. This man is also very experienced, whether he did a good job in the White House or not. Hillary Clinton and all of her supporters make the claim that Obama has no experience (which is false, even though I will be the first to admit that he is not the most experienced candidate, John McCain is....), but yet these people who DO have experience are coming out one by one for Obama. There is just something about this man that turns these people on, just like Bill Richardson. Remember, Obama was at church when his pastor, Wright, made the comments. But he said he was not there. He lied! Why???? He will lose to McCain on november. Many posters here have called Pres. Carter one of the worst presidents in history. I cannot disagree strongly enough. I will admit that he may have been ineffectual as president, but that's because he is a decent man. To put Carter in the company of Filmore or Hoover is just plain ignorant. If you want to talk about "the worst president in history", one need look no farther than the current administration! A truly admirable and highly respected ex-president. The only truly outsider to be elected in the last 50-60 years. The "Beltway Boys" undermined him at every opportunity as he was the only one who refused to compromise his morals. This was the last REAL President. I think Jimmy Carter is an honest and good person but he was a terrible President who had little experience, very poor judgment, and absolutely no ability to run anything so it doesn't surprised me he would support Obama. He never had the stomach necessary to make the really difficult decisions that a president has to make. One thing that always sticks in my mind from the time he was elected is that I was speaking with a person at our office in the south and he said he was glad that Carter got elected. I asked if that meant he was a really good governor, the reply was "NO," but it will get him out of the state! I knew the country was in trouble then! Is Obama another Carter? I don't think so, I don't think Obama is honest or good hearted just a whole lot slicker! In his excellent recent article about the Clinton campaign, "The Long Defeat," in the New York Times (I think) David Brooks said in effect that the door is closing, and night is coming. In today's excellent USA Today article, "Why the Democratic race could end in North Carolina," Susan Page provides statistics as follows: Pledged Delegates – Obama 1415, Clinton 1251, a difference of 164; total delegates available in all remaining state races are 666. My analysis based on this data shows for Clinton to (just) catch up with Obama (not to defeat him, but just to catch up) she must defeat him on average by 24.6% in all remaining races!! For every state where Clinton's winning margin is less than 24.6%, her challenge becomes even greater!! The door indeed is closing, and midnght in fact is very near.